In Eagle Talons, The Iron Horse Chronicles–Book One, Will Braddock leaves home in Burlington, Iowa, taking his father’s Civil War haversack with him. As I pointed out in my blog post on November 10, he carries his father’s Colt .44-caliber revolver, an ammunition pouch, and a percussion cap pouch in the haversack. Will typically drapes the single-strapped, flapped haversack across his body by dropping the strap over his head, with the strap resting on one shoulder and the bag hanging under the opposite armpit. This secure position allows him to maneuver without fear of losing the bag when running or diving for cover. 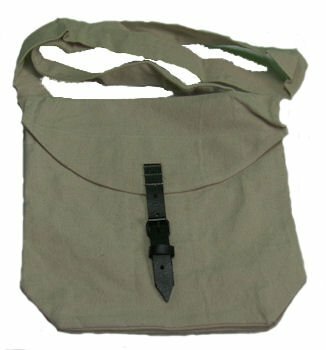 In many ways, the haversack resembles a lady’s large handbag or beach bag. [media-credit name=”Military Uniform Supply, Inc.” align=”alignleft” width=”279″] [/media-credit]Originally the haversack was used by soldiers to carry havercake, a bread made from oats and water. The name haversack probably comes from the German word for oats, hafer. The backpack or book bag has replaced the haversack in recent years as the preferred method of toting objects, but in Will’s time the haversack proved indispensable for keeping ones limited possessions close at hand. Today, Civil War and Mountain Men reenactors often include the haversack as part of their equipment. This example is sold by Military Uniform Supply, Inc.
Will loses his father’s haversack in a stable fire in Omaha early in the story, but is issued another, similar one, from Union Pacific Railroad stocks after he lands a position working on the first transcontinental railroad. Throughout The Iron Horse Chronicles, Will carries what spare clothes he owns, extra ammunition, and enough food to ward off hunger, in his haversack. His haversack doesn’t have a large carrying capacity–it measures less than a foot on each side. This entry was posted in Eagle Talons - Book One, Iron Horse Chronicles' Characters, The Iron Horse Chronicles, Transcontinental Railroad, Union Pacific and tagged Adventure Fiction, Eagle Talons, Fictional Character, Firearms, First Transcontinental Railroad, Frontier Fiction, Historical Fiction, Pioneer Life, Teen Fiction, The Iron Horse Chronicles, Western Fiction, Westward Expansion (1867-1869), Will Braddock, Young Adult Fiction, Young Readers. Bookmark the permalink.